Each day we process over one million tasks for our clients through the talent of our individual workers. While the ecosystem that makes that possible requires a lot of teamwork, the work itself is based on the skill and speed of a each worker. Yet, our definition of success goes well beyond accurate, scalable, and fast data work and enters the world of personal development, as we strive to raise up leaders in the developing world. If there is one thing you can can count on at CloudFactory, it’s finding new ways to innovate. What doesn’t change is our commitment to developing leaders in one of the most challenging environments on earth...a team. Teams win and lose together when they enter the playing field. It’s that common purpose that unites and drives a team to work together and find ways to rise to the challenge. Our approach has been to challenge our workers to grow through regular leadership development lessons and community service projects, and we’ve seen amazing results, but it hasn’t captured the intensity of a true team experience. Our hypothesis is that a key ingredient has been missing for many of our workers, a common purpose. With that in mind, we’re pursuing a new initiative with a recent group of Cloudworkers. We invited a group of individuals to our offices with a simple, but challenging goal. Present a big idea that would help change their nation for the better. 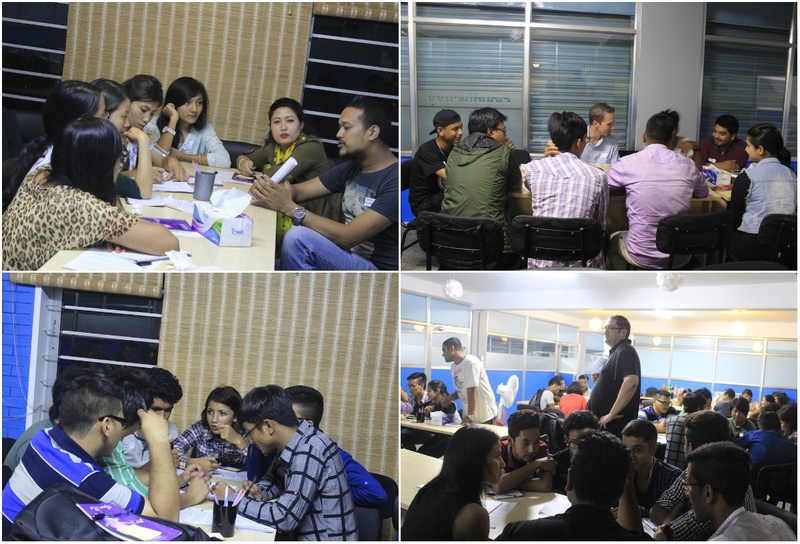 Our intent was to introduce new hires to CloudFactory and each other by forming their team around the best ideas as chosen by them. We called it a Surge Weekend and the quality of ideas and excitement that came from it was truly inspiring. This new path is more than just a different way to form teams, it’s a way engage them in the process of leadership development by focusing on a specific goal as a team. Currently teams meet regularly to discuss leadership principles and find ways to serve their communities every six weeks, but the focus of those projects can, and often does change frequently. New Cloudworkers were challenged to present their idea and be prepared to rally others around it as they work together. There is something really exciting and terrifying when faced with a list of fantastic ideas. Every candidate had just taken their 90 seconds window to pitch the group on what they think a team should do to make a difference in Nepal. We narrowed it down to the top 10 ideas and asked the group to vote for the ones they would like to invest their time and energy into. The rest of the event was an intense time of forming teams around five of those ideas, discovering how to make it work and presenting it to a panel of judges. In the end those five teams shared what to pursue as a team during their career at CloudFactory. Three ideas were connected to the imbalance of workers and opportunity in Nepal. This is the very heart of our company’s mission, yet each had their own unique spin on what they would do to make a difference. One group identified a mindset and stereotype that prevents people from working in less skilled work as it’s seen as less honorable and will be seeking ways to change that perception. Another team was looking to create a pay it forward movement of helping people find employment and asking them to pay back the kindness by helping others find work in return. The last employment focused team is pursuing a food service concept that would enable homemakers to utilize time during the day to make and sell healthy food to local businesses. The remaining two groups focused on eliminating sexual harassment of women on public transportation and empowering those addicted to drugs or alcohol through the power of music and dance. In addition to changing the way teams are formed, there is now a dedicated fund for increasing the impact of these initiatives. The Impact Initiative Fund (I²F) is a matching grant fund which was launched with donor money CloudFactory received in response to the devastating earthquakes in Nepal earlier this year. Teams will be able to leverage these funds as they develop their leadership potential through focused community service work. As a team identifies a group of people and helps them develop a plan that will lead them down a path of sustainability, they will be able to put financial resources behind that vision. True to our culture we are dreaming big about what could be as teams form around a shared vision and set out to make a difference in their communities. We are starting small to find out what works and what doesn’t and we are excited to get the rest of the company to join in the fun of rallying around an idea that could change people’s lives.